On a noisy, smokey, crowded battlefield, the crucial task of transmitting important orders was in part carried out by regimental musicians. These experienced NCOs used a variety of drum and fife “calls” to keep time on the march and communicate commands to attack or retire to the men. They also played a role in the “parley”, accompanying officers and communicating messages between opposing forces. Drumming & fifing in the regiment is one of the most important aspects of the military portrayal we undertake. 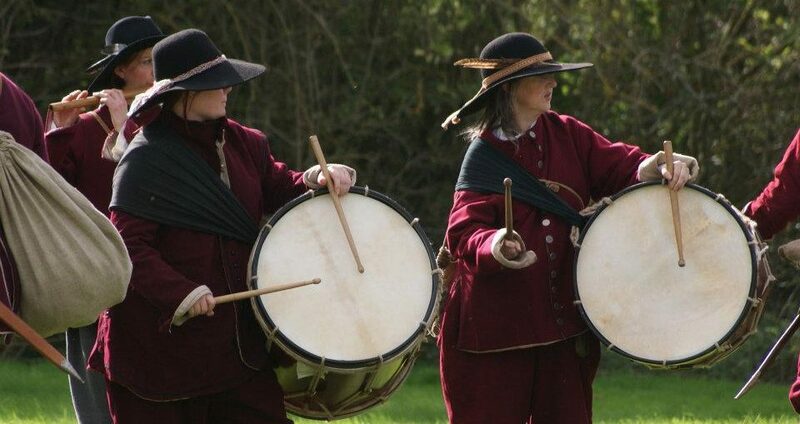 On the march the drum regulates our rate of march and gives us a presence on the drill or battlefield that no other arm or craft can ever present. The regiment marching to the drums and manoeuvring to their calls is one of the most important aspects to our displays and therefore drumming is a priority role anyone can undertake within the regiment, and we welcome anyone wishing to take up this task. We will provide the all the training and the drums required for this important role.